The Skinny: Solid debut work from director Ho Hong that manages a decent story alongside constant references to Hong Kong social issues. The film sometimes seems a little too enamored of its own cleverness, and won't be nearly as effective for non-Hong Kongers, but Doomsday Party ultimately gets more right than wrong. However, the bizarre end credits music video cannot be excused. by Kozo: Ensemble dramatic thriller Doomsday Party is an ambitious and even admirable effort that manages to tell a decent story informed by Hong Kong’s omnipresent social issues. Missteps do occur, but director Ho Hong crafts a solid debut work that’s better than many similarly-themed productions. Ho also co-writes Doomsday Party, which takes its cues directly from Hong Kong’s many problems: civil unrest, government corruption, the volatile financial market and out-of-control real estate prices. With daily tensions at an all-time high, an anonymous bomber calling himself “Skywalker” has planted two explosives, one in Hong Kong’s Legislative Council building and the other in Government Headquarters, and threatens to detonate them both. Meanwhile, two masked robbers (Kelvin Kwan and Fish Liew) show up at a branch of the Hong Kong & China Banking Corporation, using explosives to threaten a host of characters whose lives are inextricably and preposterously intertwined. Seriously, everyone knows everyone in this bank, though the audience doesn’t understand that just yet. After its in media res opening, Doomsday Party flashes back some months to detail the run-up to the bank robbery. The film is helped by its initial opacity; characters are introduced without much explanation, allowing their personalities to be established before exposition fills in the blanks. Few characters stand around and deliver their life stories unsolicited – refreshing storytelling considering the usual exposition-heavy style employed by Hong Kong filmmakers. The characters hail from all walks of Hong Kong life. Masked robbers Lang (Kelvin Kwan) and Fish (Fish Liew) are drawn together by chance; he’s a disaffected student who begins making small bombs to terrorize bullies and jerks, while she’s a mainland immigrant who feels lonely after her grandmother died. Kin-Ho (Paul Wong) is a cop who once dated bank employee Luk Wan-Yee (Kay Tse). He’s investigating Lang’s bombings, which are tangentially related to Wan-Yee and estranged boyfriend Victor Lo (Wilfred Lau), an obnoxious celebrity tutor whose billboards dot Hong Kong. Lang actually has a hidden connection to Victor that pushes him towards crime, though he’s not targeting Victor specifically. Local councilman Ho (Cheung Kwok-Keung) is involved in an affair with middle-aged housewife Rebecca (Maggie Chan), but their connections to the others run far deeper. The whole thing comes back to the Hong Kong & China Banking Corporation, specifically the branch threatened by Lang and Fish, which is also where Wan-Yee works, where Victor arrives to propose to her, where Kin-Ho shows up to enquire about his insurance (he’s going blind due to glaucoma), and where Ho and Rebecca arrive to conclude a shady transaction. The last related party is former teacher Uncle Tak (Teddy Robin), who lost a bundle from European bonds pushed by the bank and is there to protest. This combustible situation is a microcosm of Hong Kong at large, as the drama surrounding the characters is intercut with large-scale civil disobedience against the government – which is also a current trend in Hong Kong, naturally. In addition to the topical reference points, local audiences should identify with and appreciate Doomsday Party because the characters’ psychological motivations are something they should be familiar with. Less benefit goes to international or simply uninformed audiences, who receive in-film explanations on Hong Kong’s rising tensions but are more likely to pay more attention to the plot reveals and interconnected characters. Honestly, the characters are too connected, and their fates so incestuously intertwined that it becomes needless and distracting. Does Ho Hong really need such a complex web of characters to tell his Hong Kong-in-turmoil story? Probably not; the revelations of who knows who make for some surprise, but they ultimately feel like a writer reveling in his own creativity. Unfortunately, the film lacks the thematic depth or nuance to adequately justify this overwritten premise. Action does pick up appreciably in the final act, which is set entirely in the bank as the robbery and hostage crisis play out to their inevitable end. The character resolutions provide some satisfaction, though some moments are somewhat inexplicable. Despite being the most poignant character, Uncle Tak doesn’t behave in an entirely credible manner, and the showy way that the bombs explode and walls collapse in the bank while even more character connections get revealed – well, it all feels like the filmmakers are trying too hard. More time should have been spent developing the characters further, though the actors help shore things up. 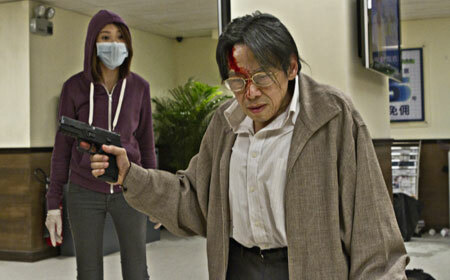 Paul Wong cuts a weary and sympathetic figure as a dedicated cop, while Teddy Robin adds more to his largely-silent role than is likely in the script. Kay Tse, Kelvin Kwan and Fish Liew do all right in their roles, distinguishing themselves from the remaining cast, who are mostly underdeveloped. As representations of the Hong Kong population, however, each serves a clear purpose.